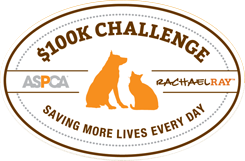 The $100K Challenge is a contest in which 50 shelters across the country compete to break their own records saving the lives of animals. Throughout the months of June, July and August 2014, each competing shelter must save more dogs, cats, puppies and kittens than they did during the same three months in 2013. See our count and learn more about the challenge.